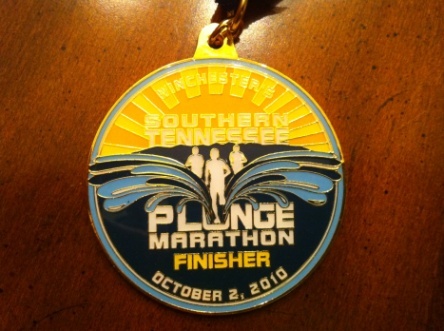 Here is the official finisher’s medal for the 2010 Southern Tennessee Plunge Marathon that took place in Winchester, Tennessee on October 2, 2010. 2010 was the first year for the marathon, but as you can see, the bling for this inaugural race was top notch. The race was won by Josh Hite in a time of 3:00:30. Rebecca Murray took second place with Chris Estes taking the bronze (More Results).